It is a known fact that water source heat pumps are the most environmentally friendly, efficient and economical ways to heat and cool your home. 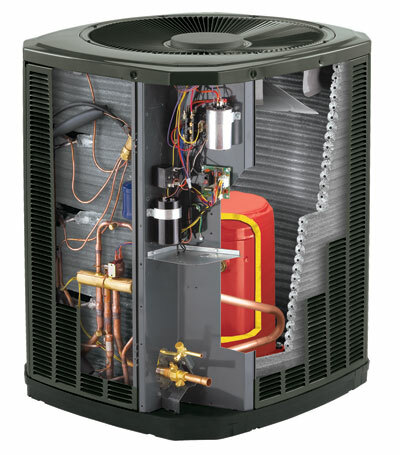 They have fewer mechanical components than other heat pumps and these components are found underground and sheltered from the weather. What people appreciate about these pumps is that they are virtually silent, they have low maintenance costs and there are no visible external units. In order to extract heat from the water, the system will require electricity, producing far more heat power than the electricity it requires. As with all heat pumps, energy efficiency will be determined by how well the system is designed and how well the system is installed. Ground or water source heat pumps which are also known as geothermal heat pumps are becoming far more common as energy prices soar. 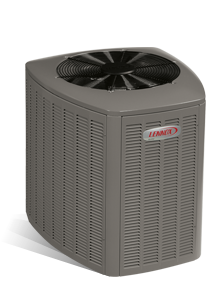 When these systems are designed and installed properly they reduce energy use and lower maintenance costs. Because they have no exposed outdoor equipment, equipment life is extended. The cost of a ground loop or water well may be quite substantial, but the simple but effective water source heat pump shouldn’t cost more than your standard heat pump. The cost of installing water source heat pumps will vary from installation to installation. A cold area and a poorly insulated home will require more heat and a larger system. These pumps are similar to ground source heat pumps in design, but installation costs are lower simply because less ground work is required. The pumps could cost anything between £7,500 and £12,000. The pumps produce heat in a similar way to ground source systems. Pipes are submerged in the water source where temperatures remain relatively constant. Liquid in the pipes absorbs the heat which is passed to a heat pump inside the house. Hybrid water source heat pump systems are the most sought after because they combine the best of water-cooled air conditioning and hydronic heating. Water source heat pumps do not create heat by burning fuel, but rather collects the Earth’s natural heat through a series of pipes. These pipes are known as a loop, which is installed below the surface of the ground or submersed in a pool. Fluid circulates through the loop and carries the heat to the house where a compressor and a heat exchanger concentrate the Earth’s energy and release it inside the home at a higher temperature. During the summer the process is simply reversed and heat is drawn from the house and absorbed by the earth. Water source heat pump systems mostly come with a 10 year warranty, but many people get 25 – 30 years service from their systems with regular scheduled maintenance. The installer keeps written details of maintenance checks. Because of the constant level of heat, water source heat pumps are even more efficient than air source heat pumps. 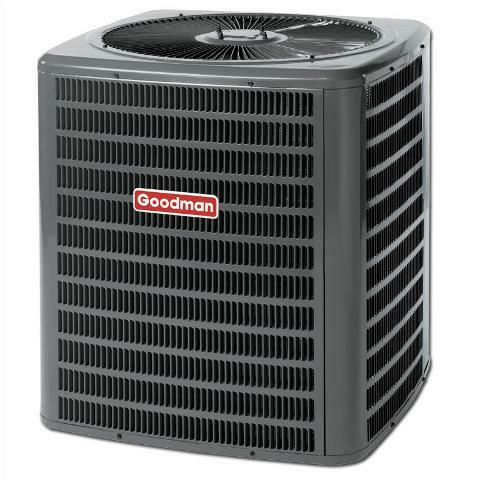 These heat pumps transfer heat from where it is not needed to where it is needed, with standard systems including a boiler and a cooling tower. Geothermal systems eliminate the energy consumed by a boiler or cooling tower and make use of the ground, a body of water, or the aquifer as a heat exchange medium. Water source heat pumps can be found in homes, offices, hospitals and many different commercial buildings where people rely on them for the reliable efficiency and comfort. By tapping into the natural temperatures well below the ground, this method is known for being particularly environmentally friendly, even though installation may be more difficult than traditional heating and cooling elements. Water source heat pumps come in three main types, getting their energy from different underground elements. 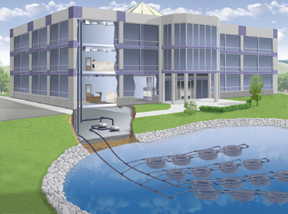 Surface water source Heat Pumps: their coils are submerged in a nearby lake at least 9 m below the surface and withdraw the stable heat. No drilling is required. Ground water source Heat Pumps – they dig deep into the ground where the water temperature is found to be much warmer than the surface air. Coils are lowered into the groundwater and linked to a heat pump in the building. The coils absorb the heat from the ground water where it is circulated to warm the building by using a traditional duct system. 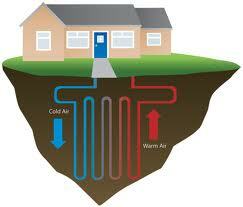 Ground source Heat Pumps – they harness geothermal energy found in rocks below the surface. Sometimes coils are dropped far below ground until the rock is found at a warm, stable temperature. Traditional heating systems take cool outdoor air and use a lot more electrical energy heating this air to meet the thermostat settings. Open loop – takes water directly from the water source to the heat pump where the heat is drawn directly from it. The water is then pumped back to the water source. Closed loop – has a plastic pipe filled with water and anti freeze which is continually pumped around taking energy from its surroundings. Lake closed loops for instance is economical when a home is situated near water like a lake and poses no threat to aquatic life. 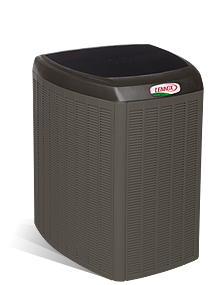 A traditional water source heat pump moves heat areas that need cooling to areas that need heating. Sometimes there are rooms that are south facing and they may need cooling while the north facing rooms may require heating. A traditional water source heat pump system was designed to do cooling and heating at the same time. For rooms that need cooling, the pump extracts heat from the air, adds the heat of compression, and rejects the heat to a water loop. The pump serving the rooms needing heat extract heat from the water loop, adds the heat of compression and rejects the heat to the air. 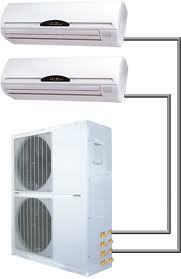 Hybrid water source heat pump systems work like a traditional heat pump system. What makes them a hybrid water heater is that they combine the best of heat pump water heaters with all the benefits you get from an electric water heat pump. By combining the two technologies, you get a super efficient design. Hybrid water heater options are affordable and offer fantastic savings with an Energy Star rating. The systems come in different sizes, for instance ceiling mounted units up to 5 tons, vertical units up to 26.5 tons and roof top units up to 56 tons. The hybrid heat pump doesn’t have a reversing valve and doesn’t use the compressor in the heating mode. The temperature of the water loop is allowed to rise above 90°. The higher the water loop temperature, the less energy is needed to generate heat, which saves on basic energy costs simply because it costs less to move heat than to create heat. Instead of the compressor being used to generate heat, the hybrid water source heat pump has a hot water coil in its unit, operating as a fan coil in the heating mode. The underground piping used is often guaranteed to last up to 50 years – the underground loop is buried underground and is made copper or of high-density polyethylene, a tough plastic that is extremely durable. Installers heat fuse joints when connecting section of pipe, and these joints are super strong. The fluid in the loop is water or an environmentally safe antifreeze solution. Studies show that a large percentage of the energy used in a geothermal heat pump system is renewable energy from the ground. It is the earth’s constant temperature which makes geothermal heat pumps so efficient and one of the most sought after heating and cooling technologies today. 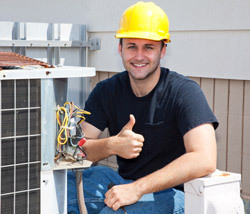 Whether you are working in an energy efficient green building you will be looking to reduce your operating costs further, water source heat pumps offer you the best combination of energy efficiency, low noise, easy control integration, compact size and flexibility along with environmentally friendly refrigerants. While they may be more costly to install they can produce lower energy bills; as much as 40% lower. This is according to estimates from the U.S. Environmental Protection Agency. Because they are mechanically simple and outside parts of the system are below ground and protected from the weather, maintenance costs are often lower as well. Surveys have been conducted and it has been found that homeowners using geothermal heat pumps rate them highly against conventional systems and that these homeowners recommend them to people finding out about which systems to buy.